Companies and individuals as well as legal representatives should take note of a recent case heard by the High Court in Bloemfontein Bainsvlei Lodges (Pty) Ltd t/a Bains Game Lodge and Others v Lessing and Another (6215/2016)  ZAFSHC 119 (27 July 2017), which is indicative of the courts attitude towards ill-considered postings. In casu, the respondent, having not received payment to the amount of R12 271.64 for goods delivered, posted on an online business forum on Facebook. Although payment was in fact due, the invoice was incorrectly issued and furthermore, the stated 30 days for payment due had not expired at the time of posting. Following communication and eventually an interdict to take the posts down, the respondent posted that he would do so only upon receiving payment. At par  the court states that “ a defamatory publication which is untrue, or only partly true, can never be in the public interest and there can be no justification for the publication of untruths… Fair comment as a ground of justification which may negate the prima facie wrongfulness of a defamatory statement can only be relied upon if the comment is based on true facts. It must be clear that the statement in question was a comment – not a fact – that it was fair, that the allegations of fact commented upon were true and accurately stated and that the comment was about a matter of public interest”. 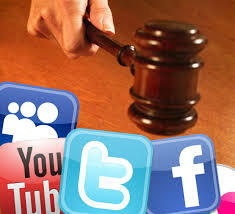 The court proceeds to refer to the posting of defamatory remarks as resorting to “ tactics that have now become fashionable. It is just so easy to sit before one’s computer or use one’s cellphone to create postings within a few minutes that will reach thousands of people within seconds and which may have serious consequences for innocent members of society. An undertaking was given that the postings would be removed immediately on receipt of payment. This amounted to blackmail. If it was really in the public interest to create the postings, there would be no reason to give such an undertaking”. Companies should ensure that their policies on online activity by employees as well as officers are clearly defined and communicated and that the sanctions and consequences are stipulated in an unambiguous fashion. Litigation in this field is bound to increase, especially considering the number of “fake” sites that have also become fashionable and has the unfortunate consequence of being shared indiscriminately and persons airing their views freely. Proving such instances can be difficult, due to the ease with which posts can be removed and/or manipulated. Should your company or client become embroiled in litigation due to such activities, ensure that the post is secured at the earliest possible time through processes that will withstand scrutiny and admissibility in a court of law.